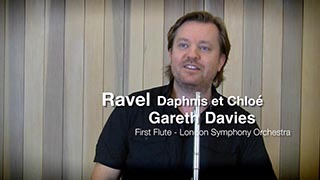 Gareth Davies is one of the flautists of his generation. He studied at the Guildhall School of Music and Drama. Shortly after graduating, he was appointed Principal flute in the Bournemouth Symphony Orchestra at the age of 23. During his time on the south coast, he recorded the Nielsen concerto with the orchestra. 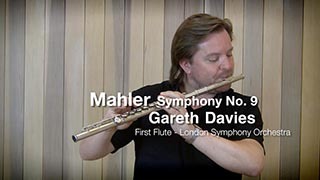 In 2000, Gareth was invited to become Principal flute with the London Symphony Orchestra where he has remained ever since. During his time there, he has played and recorded with many of the great conductors including Gergiev, Sir Colin Davis, Haitink, Previn, Jansons, Rostropovich and Boulez. A recording of a concerto by Karl Jenkins, written especially for him is available on EMI. 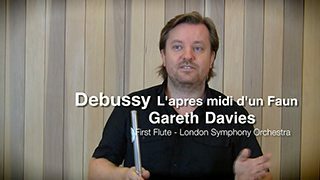 He can be heard on many LSO Live recordings including Daphnis and Chloe and Prelude a l’apres midi conducted by Valery Gergiev, as well as many film soundtracks including Star Wars, Harry Potter, Rise of the Guardians and the Twilight saga. 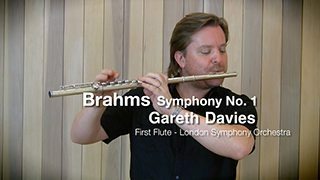 As well as performing, Gareth is in demand as a teacher and regularly coaches woodwind students at the London music colleges as well as giving masterclasses in London, New York, Tokyo and Beijing. Every four years, he is one of the directors of the LSO Woodwind Academy, an orchestral training programme for exceptional students. As part of the LSO Discovery scheme, he also works in schools in the East London Boroughs, working with young students from anything to composition, improvisation to flute performance. This culminated recently with a performance with these young people in the opening ceremony of the 2012 London Olympics to a worldwide television audience of 4 billion people. Gareth also works as a writer and presenter. He regularly writes for the LSO and also for BBC Music Magazine and Classic FM magazine as well as presenting a series of pre concert talks and interviews with Sir Colin Davis, Nikolaj Zneider, Gergiev, Pappano and Michael Tilson Thomas many of which are available online. He has recently written and presented a documentary for Classic FM and his first book, The Show Must Go On, published by Elliott and Thompson is available in bookstores and on Amazon. In his spare time he is flute professor at the Royal College of Music in London.